Eileen's Favorite Camp Craft Clay Project: Polymer Clay Mezzuzah Charms. Clay Mezzuzah Necklaces and Clay Hebrew Name Necklaces. 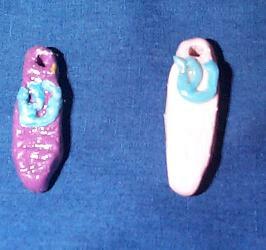 Polymer clay (in this case Sculpey ) can easily be made into clay mezzuzah charms and name beads. See Clay pages to see basic polymer clay lessons for softening and handling. Children make a small oval ball of clay. Flatten slightly the bottom so it can lay flat when not in use. Make hole with tool either side ways or front to back depending on how you will string it. Take a small scrap of clay and roll into a snake. Take snake and write the Hebrew Letter Shin to represent G-D as on larger mezzuzahs. When done use a tooth pick or pointed object to carve their name or initials on back. Charm can be strung by itself on Hemp, Gymp, Cord whatever or beads can be added. Beads can also be made out of clay. Make small balls of clay or cubes of clay one for each letter plus two for small beads . I prefer cubes as the flat back allows the beads to sit on a tray and does not have to be baked on a wire or stick to keep round. Poke hole through clay side ways. Roll out long snakes of black clay. Use snake to WRITE in hebrew the letters of their names. You probably will need to ask parents before this project for children's Hebrew name and spelling. You still may want to put on a stick or wire to keep childrens beads together. After baking while still on sticks, paint Sculpey matt or gloss finish or use Future floor wax. When dry string on cord or gymp.